Cancel that it’s a rust bucket. https://www.gumtree.com/p/cars-vans-motorbikes/vw-lupo-17-sdi-30-a-year-road-tax/1324798229?utm_campaign=socialbuttons&utm_content=app_ios&utm_medium=social&utm_source=whatsapp Might have jusy found myself a new one. Make that number 4. I must have a S model. Still sat in my car port with a list of jobs to do to get it past a MOT. Skezza, mk2 I think I am going to have to put it back on the road. Found a garage that I can do the work in. New year jobs for me. It’s not true Salisbury is safe! And we get free parking on a Sunday tyvm. If it helps I am in Amesbury just off the A303. Andrew I am truly grateful for the last 5 year of fairly trouble free and certainly very cheap motoring. Might have to keep it at this rate. Still no offers. Feel free to bring your respirators. 🤢 I would love to fix it up and keep it on the road but the wife is a little less willing than me. HELP! SDI power steering pipes burst. Refurbished powesteering line. £60 from pirtek. Cracking job. Even put a joint in for me after the flexi hose part to make to easy to fit back in with no problems. Gave it a quick service at the same time new oil and filters. 35% off at Euro car parts helped out. Thanks, have you both used pirtek before? Would they make a set of hoses for it? Is this the only option? Anyone in the Salisbury area that could help me out? 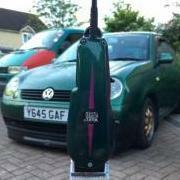 VW LUPO 1.7 SDI 2001 I am looking for some help getting my trusty steed back on the road. Monday my power steering pipe split spraying fluid all over my drive. If Mondays are not bad enough already. I am struggling to find the part online or with a breakers. Dose anyone have any? Or knowlage on how to get it back on the road? Or is willing to help me? (Wiltshire area) I don’t really want to give up on it just yet. Thanks Skezza, You seem to be the go to guy for SDI's. I will try and take a look. Will I need a ramp or are they easily accessible under the car? What do i need to check for? Good evening all, Pretty new to the whole forum thing but have been amazed by all the knowledge on Club Lupo. Now I need some help. I have a 2001 SDI with about 80,000 on the clock. Problems 1. Power steering only works going right. I have topped up the fluid and tried to bleed the system but still no luck. Going left is much harder working against the pump. Turing right is not smooth it feels like it jolts and the power steering kicks in. I would love to tell you how it started but i lent my car to a friend as his car was in the garage being fixed and got it back like this. If there is anyone local to me (Salisbury Wiltshire) that has good knowledge of this to help. I have a few more smaller issues to fix along the way so this list may be added to. Hope someone can help. SDI EGR valve blanking off - how? I am also interested in doing a EGR removal on a SDI has anyone got a step-by-step for this? Also what was the quality of the ebay part?